Aberdeen are heading back to Hampden this weekend when they face Celtic in the Scottish Cup semi-final. It marks the eighth last four tie under the Derek McInnes regime at Pittodrie and the fourth in this competition. The Dons geared up for the tie with two important wins over Motherwell and Dundee to get their league campaign back on track with Sam Cosgrove hitting 20 goals for the season in Saturday’s trip to Dens. Celtic go into the game on the back of a goalless draw with Livingston, although they remain eleven points clear as they close in on another league championship. 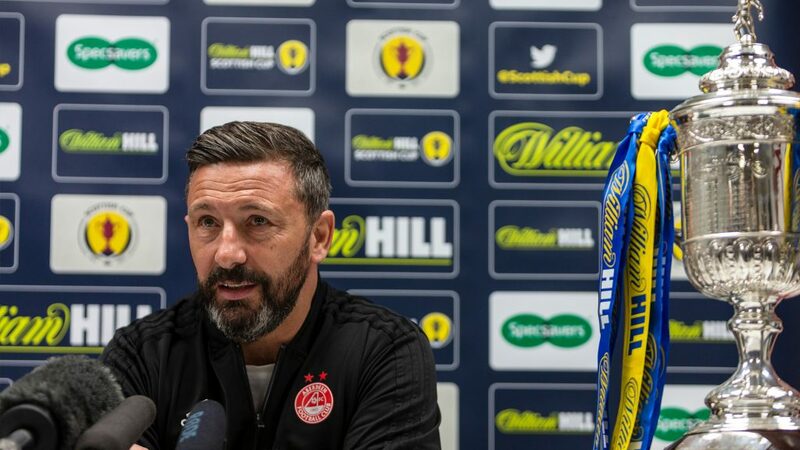 On Tuesday Derek McInnes, Max Lowe and Scott McKenna spoke with the media ahead of the big match. There are also additional interviews with Joe Lewis and Lewis Ferguson on RedTV. “There’s only four teams that can win it now and we want to make sure we put our best foot forward on Sunday and get ourselves into another final. The Dons kicked off their Scottish Cup campaign back in January when the hosted League One side, Stenhousemuir. It was expected to be a routine victory for Aberdeen, but their opponents were well up for it and earned a hard fought replay. Max Lowe opened the scoring on his second Dons debut, but Mark McGuigan equalised with 20 minutes remaining to level the tie. The replay brought a much more professional performance from The Dons as they went three up at the break thanks to goals from McGinn, Cosgrove and Stewart. Munro gave the hosts hope, but a spectacular own goal from Donaldson put the game to bed, earning Aberdeen a first ever victory over Stenny. The Dons were drawn against another old foe in the fifth round when Queen Of The South came to Pittodrie. A nervy first half burst into life when Niall McGinn was introduced at the break and within two minutes the Northern Irishman had the reds ahead. Only three minutes passed at Queens were back level when talisman Stephen Dobbie hit a rocket from 35 yards that nearly burst the net. 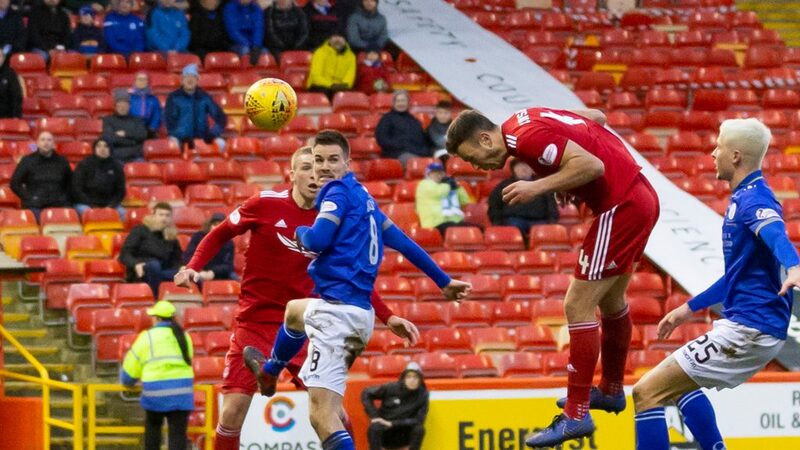 The visitors were making an uncomfortable afternoon for the Pittodrie crowd, but Andy Considine restored the lead with a free header from a corner. Cosgrove added a double to take the sting out of the Dumfries side and The Dons were through to the quarter-finals. 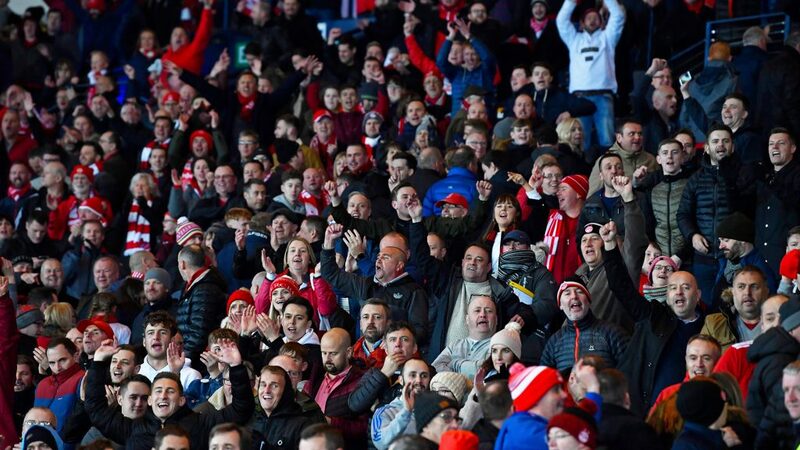 There was no denying what the tie of the round was when Aberdeen and Rangers were paired together in a mouth-watering clash with the winner heading to Hampden. 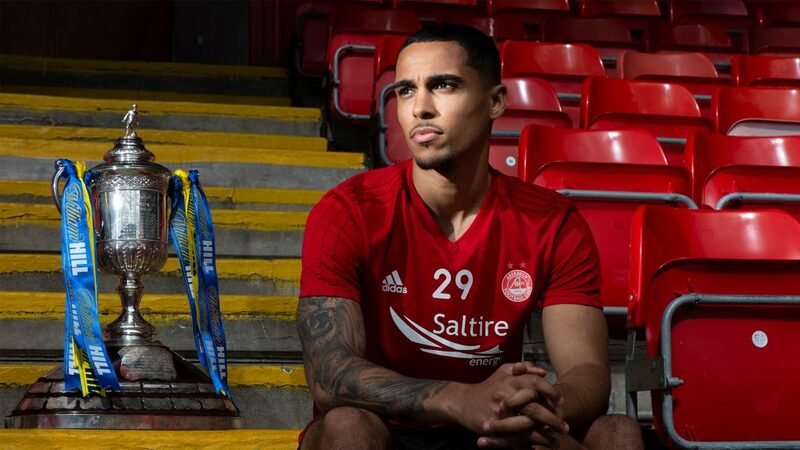 Sam Cosgrove got Aberdeen off to the perfect start when he fired home from the penalty spot after Gary Mackay-Steven was chopped down in the area. The Dons were good value for their lead, but switched off at a corner and Joe Worrall equalised, which meant another replay was required. The teams locked horns for the sixth time this season down at Ibrox. The Dons had already won twice in Glasgow and would make it a hatrick over the Govan side with a magnificent display. Niall McGinn stunned the home crowd by latching onto a loose ball and firing home with less than three minutes on the clock. To a man The Dons were superb on the night and defended so well, but always looked threatening on the break. Despite having plenty of the ball, Rangers could not breach the Aberdeen goal and Connor McLennan sent the small pocket of the Red Army in the corner into a frenzy when he made it 2-0 on the hour mark. Ultimately Rangers ran out of ideas and The Dons comfortably saw out the match to book a date with holders Celtic a month later. 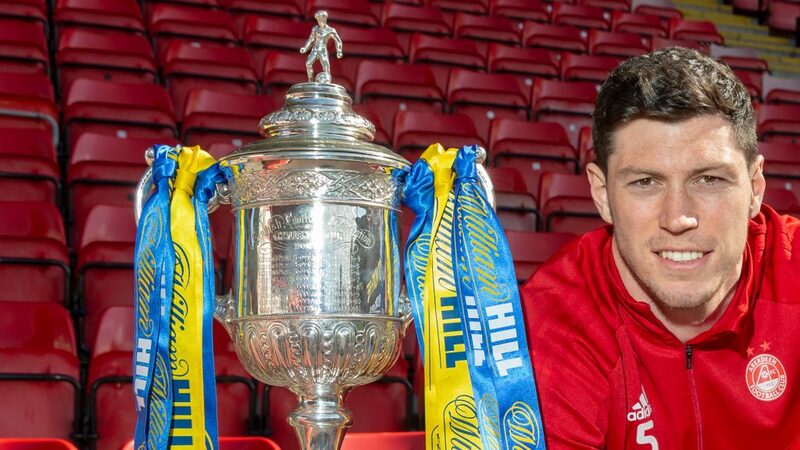 This is the 38th time Aberdeen have reached the semi-final stage of the Scottish Cup. This will be the 50th Scottish Cup semi-final tie played by Aberdeen. In the previous 49, they have won 16, lost 21 and drawn 12. They have scored 59 goals and conceded 60. This will be the sixth meeting of Aberdeen and Celtic at this stage of the competition. In the previous five, Celtic have been victorious on four occasions – in 1907-08, 1910-11, 1925-26 and 2010-11 – with Aberdeen’s only success coming in 1982-83 when Peter Weir’s goal gave them a 1-0 victory at Hampden. Celtic scored eight goals to Aberdeen’s two in these meetings. 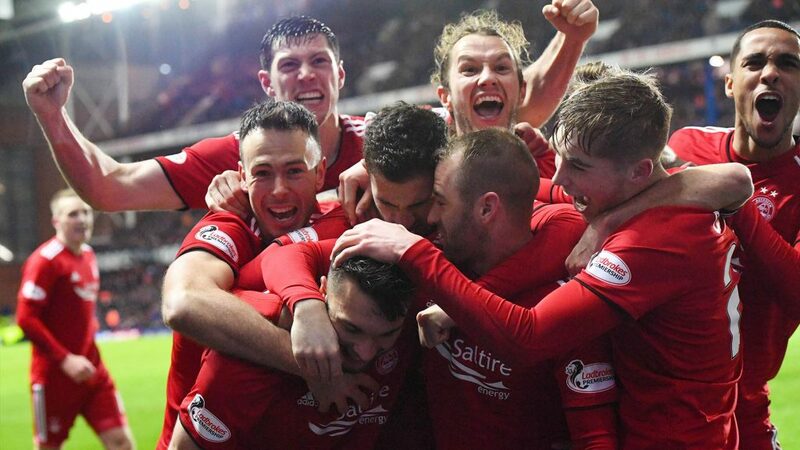 This will be Derek McInnes’ fourth Scottish Cup semi-final, losing two – to St Johnstone and Motherwell – and winning one against Hibernian in 2016-17. Of the current squad, Niall McGinn (v St Johnstone) and Andrew Considine (two v QOS in 2007-08) have scored goals for Aberdeen in Scottish Cup semi-finals. Stevie May scored two for St Johnstone, ironically against Aberdeen in 2013-14 at Ibrox. Sunday marks the fifth meeting between the sides this season and each game has been a tight affair. Although Celtic have the upper hand with three wins and a draw, The Dons can take confidence that only a goal has separated them on each occasion and the last visit to Glasgow was a hard fought 0-0, a game in which they could have won. Celtic’s run to Hampden started with a 3-0 victory over Airdrie followed up with a 5-0 win against St Johnstone. Neil Lennon was back at Easter Road in the Quarter-Final and they saw off his former club Hibernian 2-0 to set up Sunday’s meeting with The Dons. Their goal scorers have been Timothy Weah, Scott Sinclair (5), Scott Brown (2) and James Forrest (2). If you can’t make the game on Sunday make sure to tune into our RedTV coverage from 1.45pm. 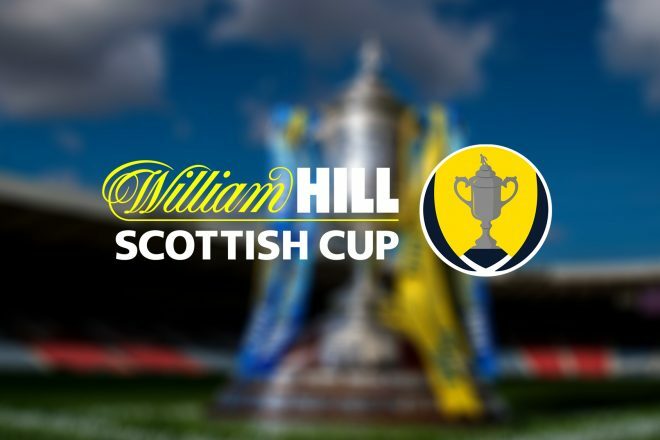 Former Dons captain Paul Hartley joins Dave and Andrew and international subscribers can watch live, with UK based supporters able to receive live audio from Hampden Park. Post-match we will have reaction, highlights, goals and a full match replay. Around 14,000 Dons supporters are expected at the national stadium and we thank you once again for the fantastic support. Come on you reds!! The Dons lost out at Hampden finishing the match with nine men after Ball and Ferguson saw red either side of half-time. Aberdeen were forced into a late change after Niall McGinn injured himself in training on Saturday morning. It was a big blow for The Dons. Niall has chipped his ankle and will miss the rest of the season. Within the first minute hesitation at the back by McKenna allowed McGregor space to run into. 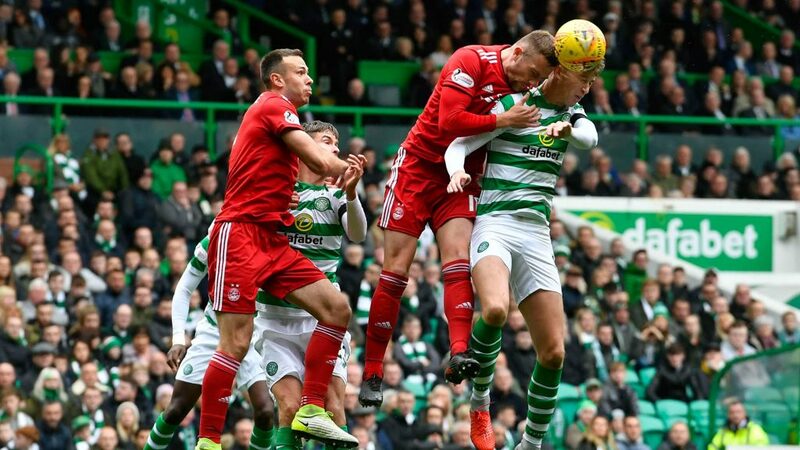 His low cross was about to land at the feet of Edouard with Forrest also there but Considine came over to make a brilliant tackle, taking the ball as well as both Celtic players. On four minutes Simunovic was allowed to run 40 yards without a tackle and once he reached the edge of the area he put in a low shot which produced a superb save from Lewis at full stretch. The keeper had to get down low and tip the ball round the post with his left hand. From the corner Simunovic had another great chance when his late run into the area was not checked but he was unable to good enough contact and Dean Campbell on the post watched the ball go past. Moments later Hayes on the left got in behind but his low cross went beyond everyone before Christie curled a shot over the bar. It had been a fast start from Celtic. After eight minutes a push by Brown on Stewart gave Aberdeen some much needed territory up the field and a free kick in a good area. All the defenders went forward but the Dons tried to play it short – Stewart did well initially to beat his man but was then crowded out. By the 15 minute mark, Aberdeen had at least settled and got their defensive shape sorted. After 17 minutes lovely play by Stewart inside his own half released Cosgrove. The Dons won a throw-in on the left which was taken quickly by May to McLennan. The winger flicked the ball over the defender, but Bain was able to gather. A few minutes later Aberdeen got themselves in trouble when they gave away possession on the half way line. Celtic worked it to Forrest who was one on one with Considine. He went around the defender but then threw himself to the ground looking for a penalty. Referee Craig Thomson booked the winger for diving. On 24 minutes Tierney twisted and turned his way to the by-line. His cut back picked out Edouard but the Dons defence did well to prevent a clear shot on target and Ferguson was able to hack the deflected effort away. After 26 minutes Dom Ball was booked for a trip on Hayes, a booking which would prove to be costly. It was extremely harsh as it was Dom’s first foul of the game and Jonny had run the ball out of play. After the half hour mark there was a slightly comical moment when the ball boy caught the ball before it had gone behind for a goal kick. Credit to Edouard who refused to contest the bounce ball and put it behind for an Aberdeen goal kick. In the 35th minute a neat move down the right involving Stewart allowed Dom Ball to put over a dangerous cross which found Cosgrove in space and his first time effort went just past the post. It was a difficult chance but the striker did not quite catch it the way he wanted. A minute later disaster for the Dons when Dom Ball was given a second yellow card for a foul on Ryan Christie. It was accidental but the referee deemed it to be reckless. Aberdeen had a chance to reorganise as Christie was stretchered off with a head injury. He was replaced by Tom Rogic whilst Aberdeen brought on Devlin for May. In the last minute of the 45, the ten men of Aberdeen produced a nice move which saw Stewart clip in a cross for Ferguson and his header was not far away. The Dons then had six minutes of injury time to survive but it was not to be. 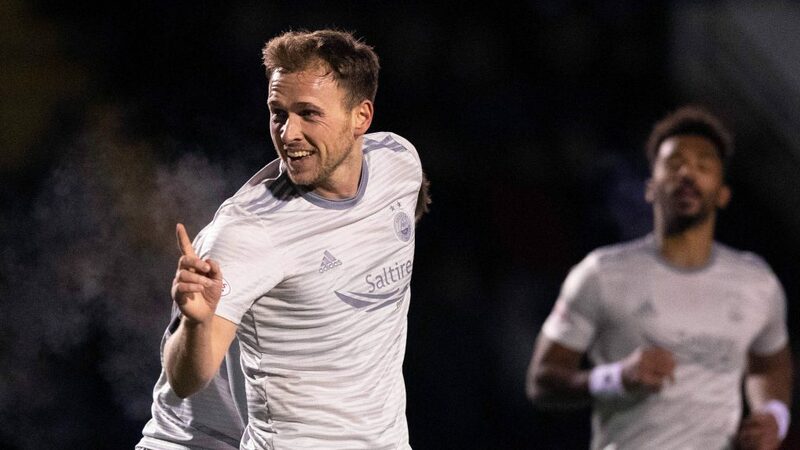 In the second minute of added time Forrest picked the ball up thirty yards out, he was allowed to run into space and he punished the Dons when his shot found the back of the net. The same player should have added a second two minutes later but Lewis made a great save with his feet. The goal was a real moment of quality and a hammer blow for The Dons. It was going to be a long second period for the Dons who would have to work tirelessly to stay in the game. In the 50th minute Max Lowe missed a good opportunity for a cross when he slipped in an advanced position but the same player did brilliantly a few minutes later to clear a McGregor shot off the line with the back of his heel. On 53 minutes Considine was booked for taking down Edouard on the edge of the area. The free kick deflected up off the wall and the Dons were able to clear. Aberdeen had done well but to stay in the game but Cosgrove was getting nothing up front, Celtic crowding him out on and off the ball. Then on the hour mark it was all but game over as Devlin let a ball go over his head and Hayes nipped in. There seemed to be very little contact but the former Aberdeen winger went to ground and referee Thomson pointed to the spot. Lewis went the right way but Edouard found the net. Frustration was then beginning to creep into the game as Lowe picked up a yellow card for a late challenge on Brown. Again Celtic had a free kick on the edge of the area but the wall did its job. 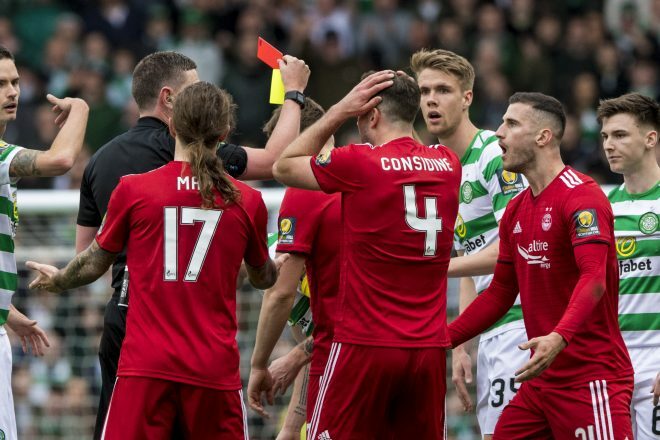 On 67 minutes Lewis Ferguson was shown a straight red for a foul on Rogic and there were no arguments this time round. Celtic made a mess of the free kick but the ball landed at the feet of Rogic who swept it into the bottom corner from 20 yards. After the goal Gleeson came on for Stewart as Aberdeen looked to control the damage with nine men. Just after the restart Lewis tipped over a powerful strike from Hayes. The big keeper couldnt be faulted for his efforts. With about fifteen minutes to go Derek McInnes was sent to the stand. Tony Docherty had also been sent off at half time so Paul Sheerin took over on the touch line. Cosgrove was replaced by James Wilson with five minutes remaining. With a minute to go Lewis again was on top form to tip an Edouard shot around the post. A very disappointing afternoon as nothing went for the Dons.